Recently, while admiring a picture of a beautiful fountain, I started thinking about the most beautiful fountains that I had seen during my travels around the world. This post is a result of that reflection. This first part has fountains from countries that start with "A" to "G", that means from America to Germany. The criteria for selecting the fountains presented in this post were different such as beauty, expression of quirky ideas, quality and materials of the sculptures and the quality of images. While I searched for the images of fountains in my image-collections, I realised that in some countries, especially in Asia and Africa, fountains are not very common, while Europe seems to be full of them. 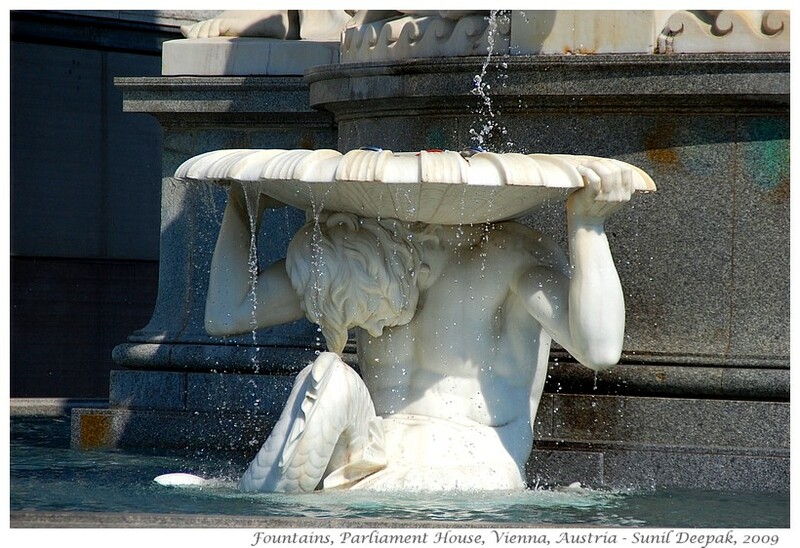 From some countries, I did have a few images of fountains, but they did not inspire me. So many countries are missing from this post. 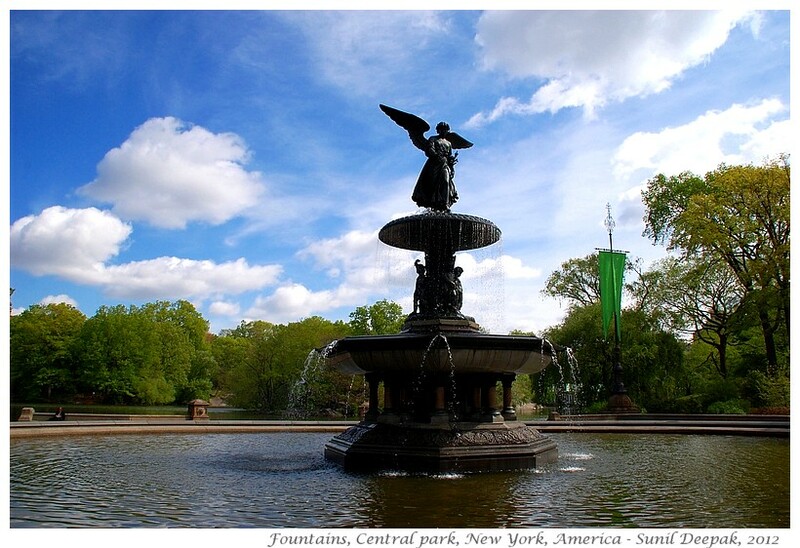 I will start with 2 fountains from New York, America. 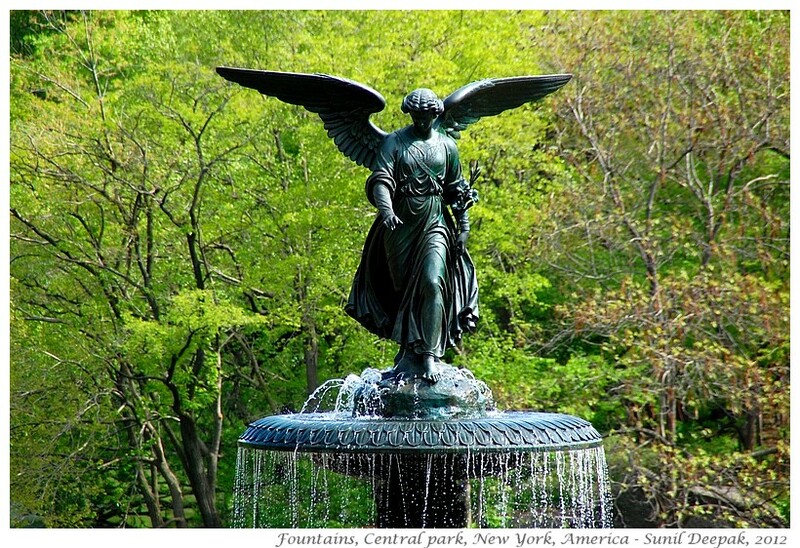 The first fountain is from the Central Park and is shown in the image above. It has an angel, who is shown as an 18th century young woman with short curly hair, wearing a long dress and holding some flowers in her left hand. It seems as if she walking in a mountain area, her feet ready to wade in the waters of a gentle torrent. The second fountain from New York is in front of the Lincoln centre. This one does not have any sculptures, it is about thick streams of gushing waters surrounded by a round black ring. 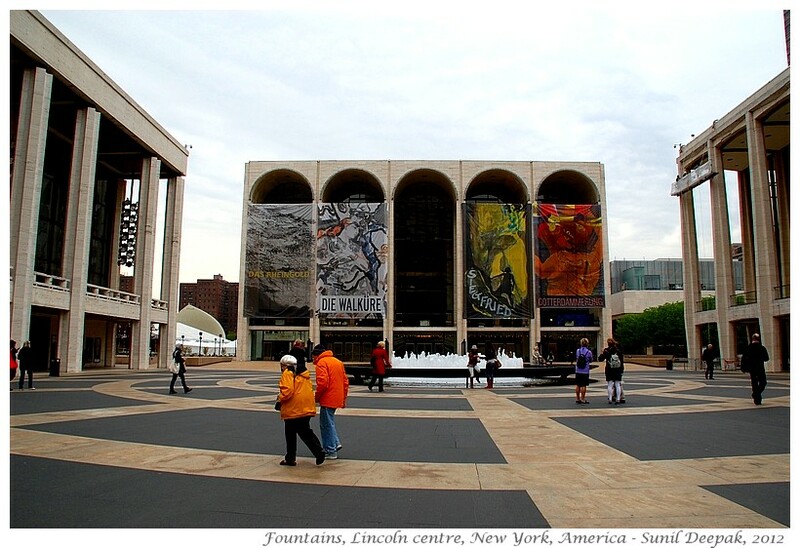 The colourful posters on the front of the Metropolitan Opera building form its background. Next there are 3 fountains from Vienna, Austria. 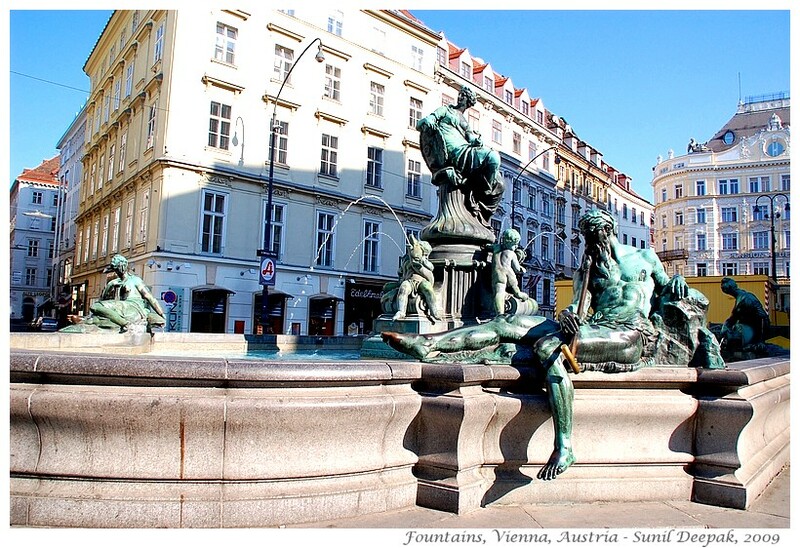 Vienna is full of baroque marble sculptures and there are many fountains. 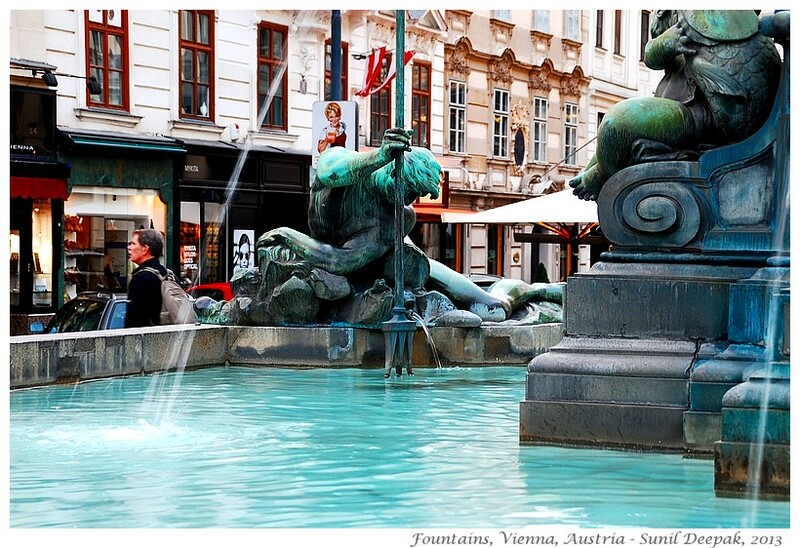 The first Viennese fountain is from the old part of the city. It has a young royal looking woman sitting on a high chair in the centre of a pond, slightly turned to look behind her, while there are baby angels on the sides of her chair. On the outer walls of the pond, there are figures of men and women, inspired from Greek mythology. In this fountain, I especially like the sculpture of the young Neptune, using his trident for fishing in the pond. I love this kind of irreverent attitudes expressed by the sculptors and artists, refusing to take themselves too seriously. 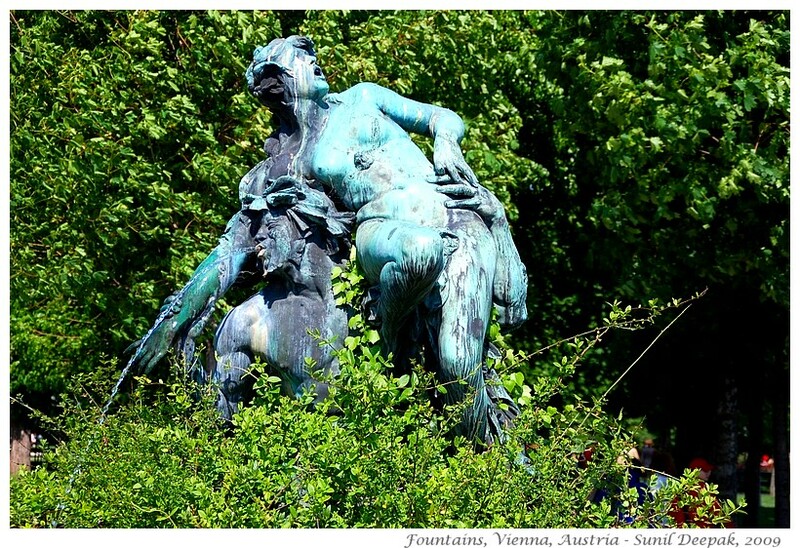 The next Viennese fountain is from a park near the opera building. It is inspired from the Roman mythology and depicts the abduction of the Sabine women. If you have been to Florence (Italy), perhaps you have seen the more famous sculpture of Gianbologna on this subject in the Loggia dei Lanzi in the Signoria square? However, here the water gushing out of the man’s mouth, makes him look as if he is vomiting and takes away the seriousness of the subject. Perhaps it is the depiction of actors doing rehearsal of a play? Or it is something more sinister, as if the man spitting out water is a way to express how he is going to ravish the kidnapped woman. What is your opinion? 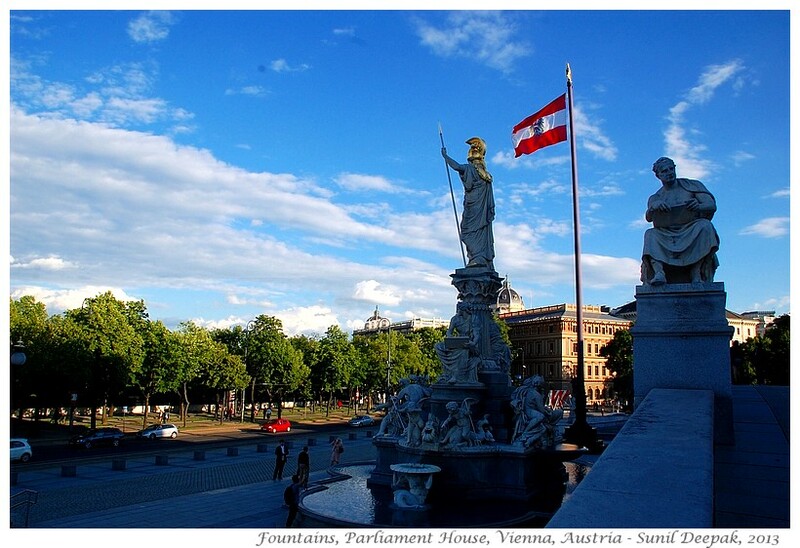 The third and the last Viennese fountain of this series is placed just outside the Austrian parliament. Underneath a goddess with a Roman soldier’s headgear sit serious looking old men and chubby angels, inspired from the Greek mythology, while water gently falls down into round pans placed on the heads of young muscular male figures, bent under its weight like Atlas holding the earth. The fountain from Brussels is almost a non-fountain. It is a tiny fountain placed in the middle of a lake, out of which a tiny stream of water comes out so if you don’t look at it carefully, you can easily miss it. I loved this lake surrounded by lush green vegetation. It is difficult to imagine such a wonderful place so close to the centre of the city. Those of you who have been to Brussels, might ask why I have not included the famous “peeing boy” fountain (Manneken Pis) in this post. It is supposed to be one of the landmarks of the city and the souvenir shops of Brussels are full of tiny statues of that boy. However, I was a little disappointed when I had seen it and thus, I have decided to not to include it. On the other hand, I love another icon of Brussels, the comic book boy hero Tintin. The souvenir shops of the city were also full of his statues. I am sure that if the city had a Tintin fountain, I would have included it here! I have chosen 4 fountains from Brazil for this post. 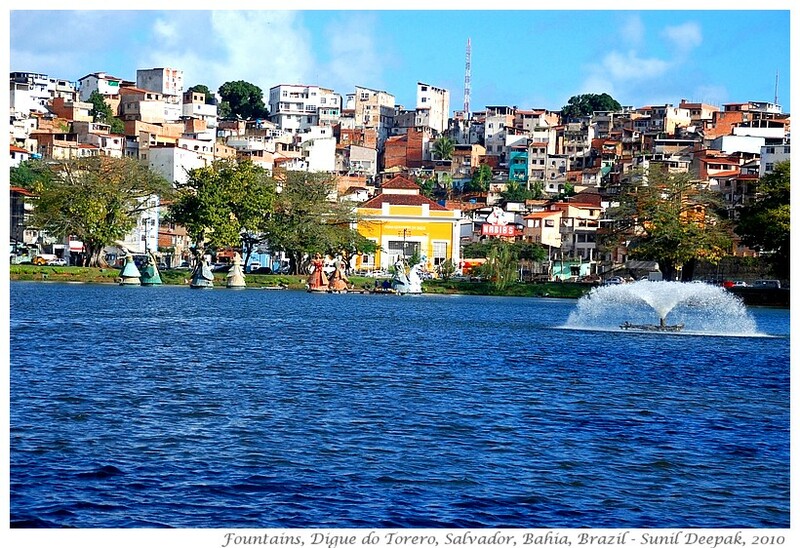 The first one is from the Digue do Torero lake in the Baixa part of Salvador city in Bahia state. 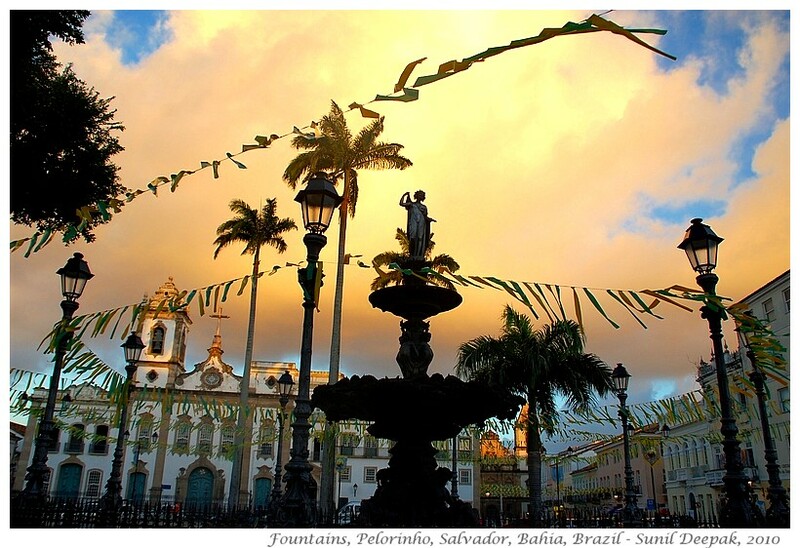 Salvador is also the focal point of those who believe in Orisha gods, the religion of Yoruba, brought as slaves from Africa. 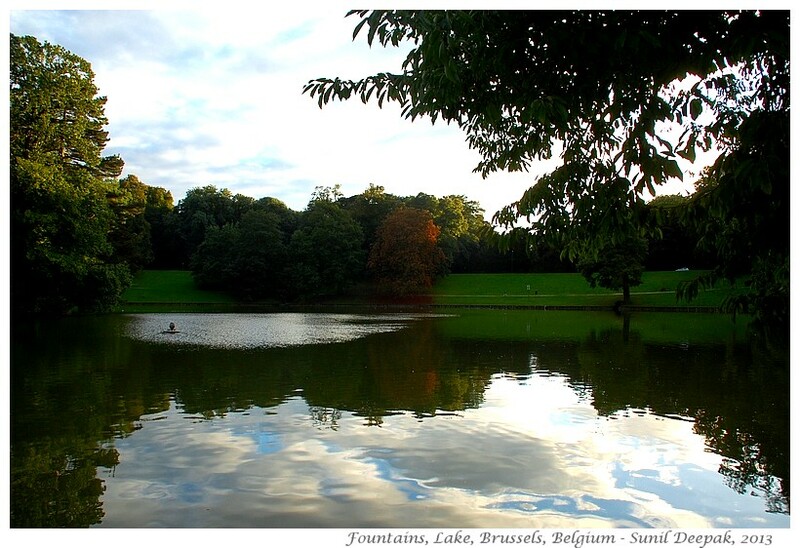 This lake is very beautiful but the fountain is nothing special. However, since it is next to the statues of dancing Orisha gods standing in the lake waters, it has a wonderful backdrop and that is why I have included it in this post. The second fountain from Salvador is from old city centre of Pelorinho in the Alta part of the city situated on the top of a hill. The last time I was there, it was the sunset time and I was mesmerized by the clouds tinged pink and orange against a blue sky. It was a small fountain in a park near the church. I really love this picture. 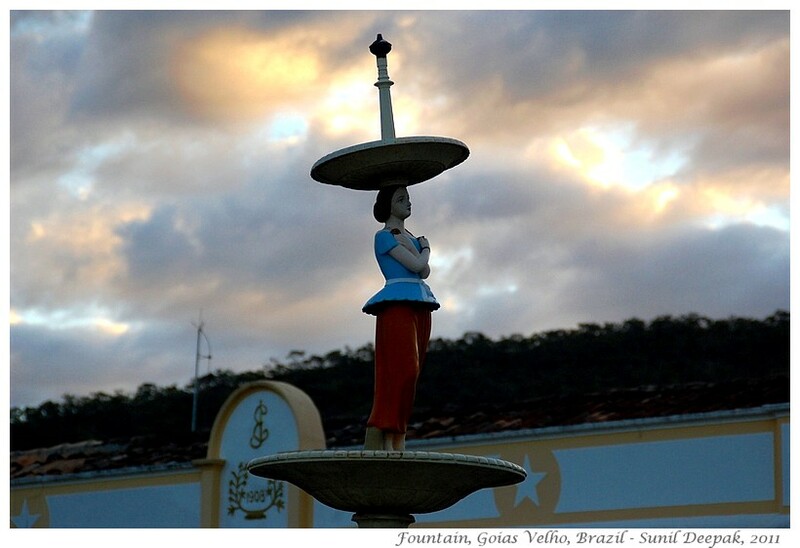 The third fountain from Brazil is from Goias Velho, the old city in Goias state in the central part of Brazil. Like the fountain from Pelorinho, even this is an unassuming fountain from the Portuguese colonial part of Goias Velho. It has a Portuguese peasant woman standing demurely facing the cathedral. The picture is made special by the dramatic colours of the sky behind. I think that without the dramatic evening colours of the sky, these last two fountains would not have found a place in this post. 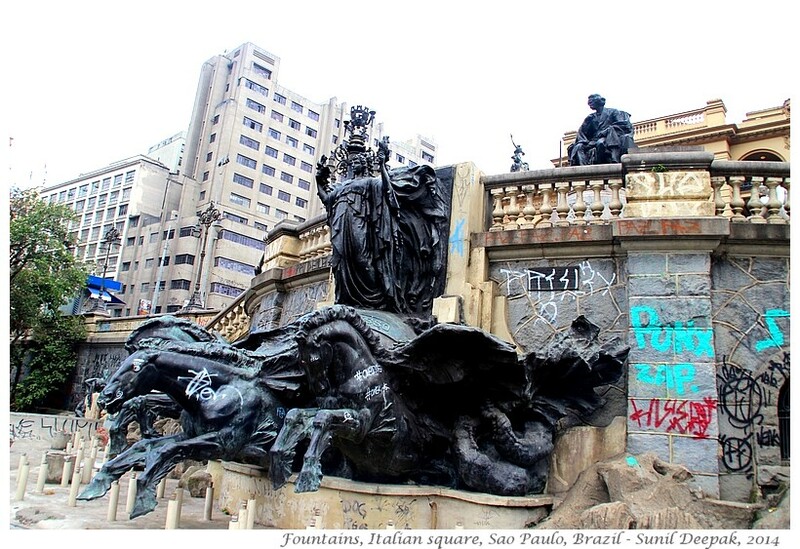 The fourth and the last fountain from Brazil is from San Paulo, from a park near the opera building in the old city. 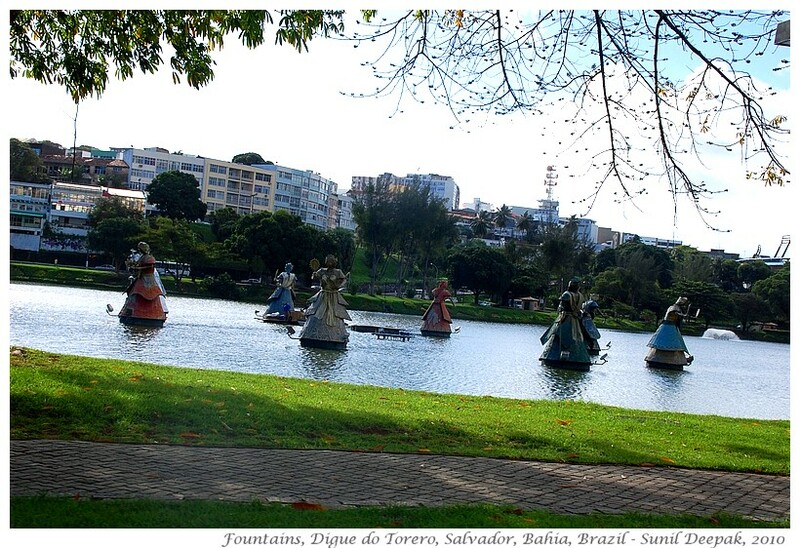 This part of the park and this fountain were built by the Italian immigrant community of San Paulo to highlight their contribution to the city. The galloping horses of this fountain remind me of the Trevi fountain in Rome (Italy). The violent graffiti on the sculptures and the walls surrounding this fountain, adds to the sense of urban decay and abandonment of this place, making it look like a noble family fallen on hard times. Looking at this fountain, I could almost smell the rancid beer and feel the sleepy looking eyes of drug addicts, sitting nearby, checking me. The next two fountains are from London, another city that has many beautiful fountains. 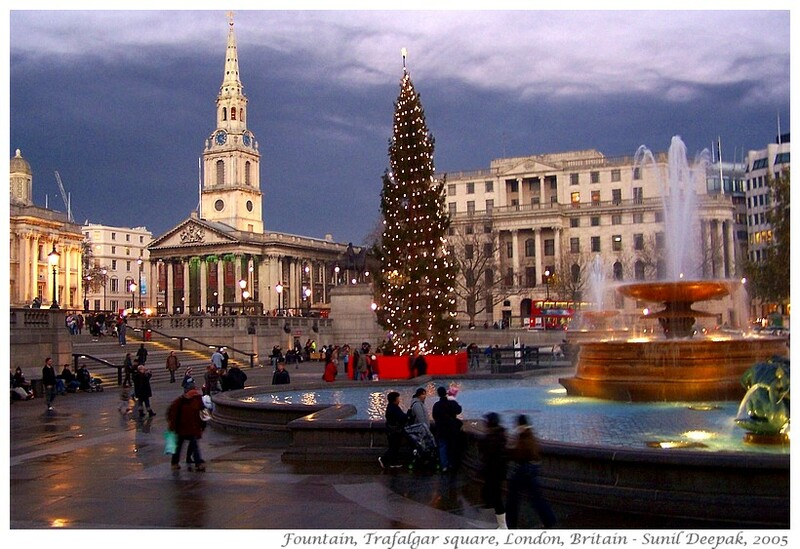 The first image is from the Trafalgar square taken with a simple Kodak camera in December 2005. That day there had been a big explosion and fire in the city, so the sky had turned black with dark smoke clouds, making for a dramatic background to the Christmas tree with lights. 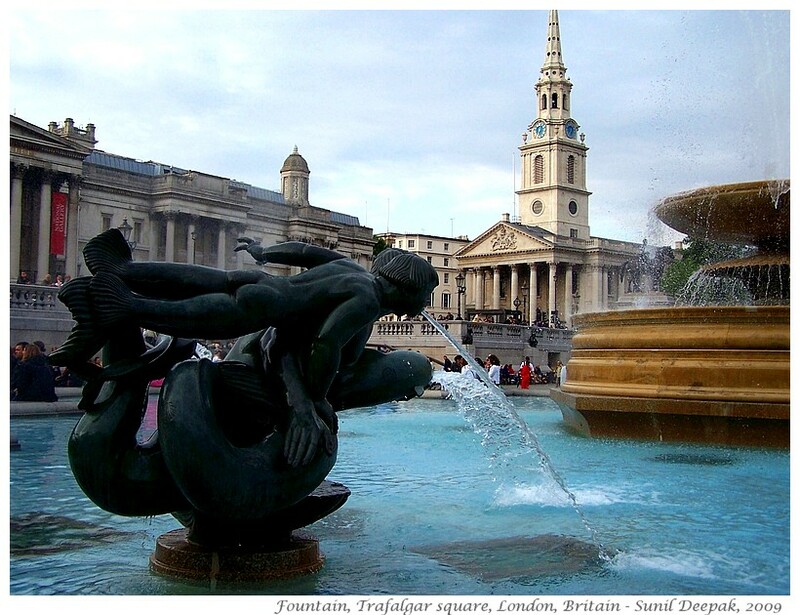 The second image taken a few years later, shows a detail from one of the fountains in Trafalgar square. It has a boy mermaid with the two fish tails (like the rubber fins that people sometimes put on for swimming), riding on a dolphin, with a stream of water gushing out from his mouth. It makes me think of children vomiting due to motion sickness. 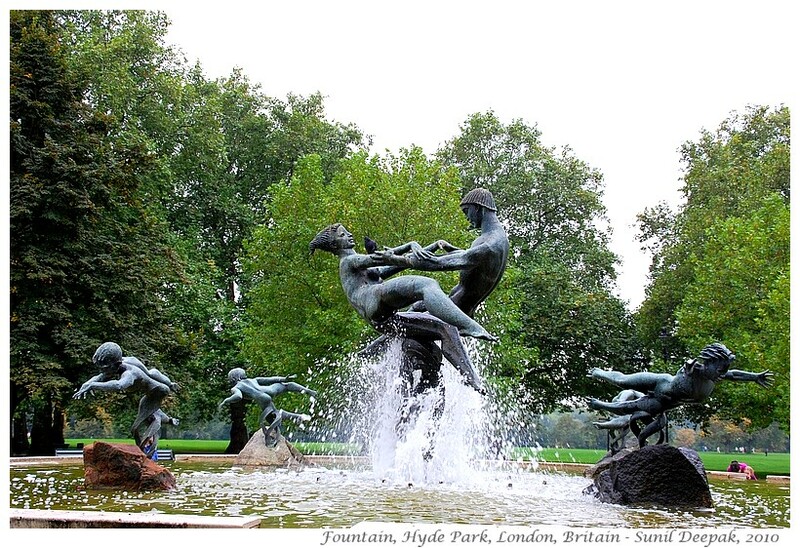 The second fountain from London is from the Hyde Park, near the Mable arch entrance. It has been designed wonderfully. The couple holding each other are balanced on the back of a dolphin that rises up from the centre of the pond, making them look as if they are floating in the air. On the four corners of the pond, four boys are jumping as if they are frogs, startled by the sudden appearance of the dolphin with the couple from the depths of the waters. 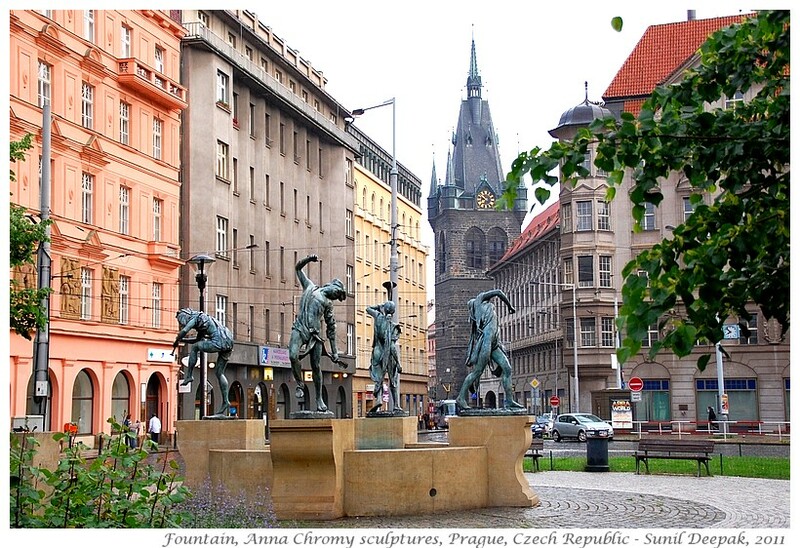 The fountain of blindfolded musicians and dancers in the old part of Prague is a personal favourite. I love going back and looking at the images of this fountain. It reminds of one of the reasons of my love for photography – the possibility of stopping, looking at the details and discovering new things about things and people. Each sculpture of this fountain is so exquisite, expressing the joy of music and dance. They seem to be flying in the air. 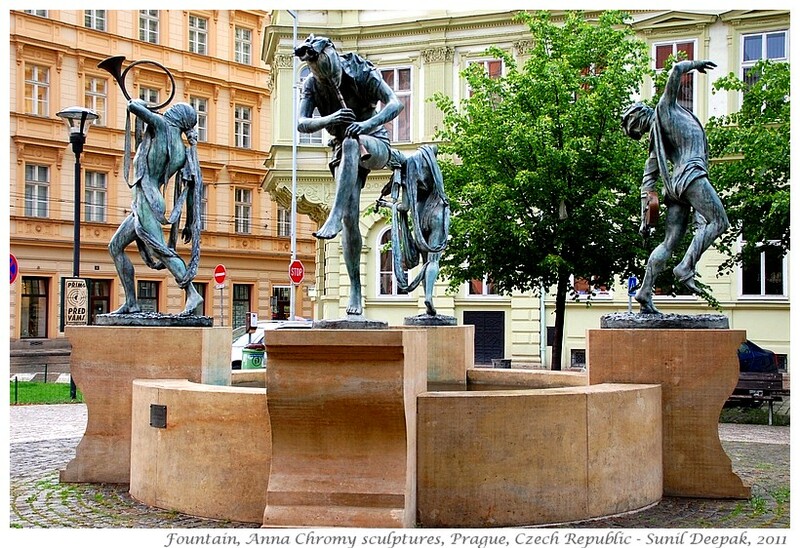 These sculptures are by the Czech artist Anna Chromy. 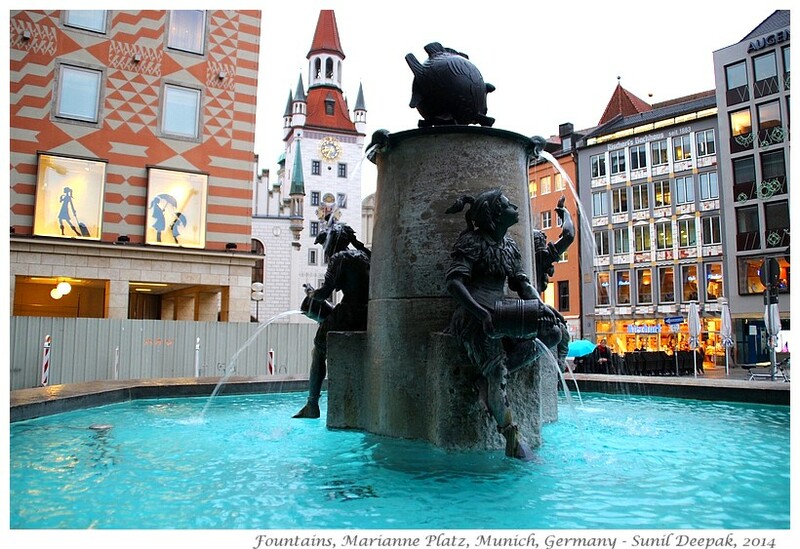 The last image in this first part of the post about fountains from different countries is from Marianne platz in old part of Munich, near the cathedral. There is a ball like round fish at the top with water coming out from its mouth. Water also comes out from three small pipes near the top. Finally, a gentle flow of water comes out from the vases held by 3 Peter Pan kind of boys who look lost in day dreams. With lovely blue water in the lighted pond, this fountain looks very harmonious. Preparing this post I had a lot of fun going through lot of images of fountains and deciding which ones to keep and which others to exclude. I have chosen a mix of fountains that evoke different emotions and are not just about beauty. I hope that I have made you pause, see these fountains in the way I see them, and think of different ways of appreciating beauty and art. Often when we visit places, we see things but usually we do not stop to really look at things and to understand their details and think about their significance. I hope these pictures have helped you to see some of those details. Part 2 of this post will continue the remaining part of this journey. Sir, Your analysis is par excellence and in depth.